Wonder how to get K/DA Akali? It is available in the League of Legends shop! You can hop right in there and buy it right now and test it! The skin is showcased in the skin review to the right! 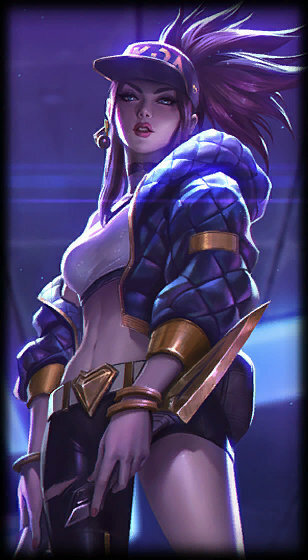 K/DA is a series of alternate future/universe skins in League of Legends. Set in an alternate universe where the pop music industry has become largely popular. Having a real-life counterpart K/DA performed during the opening ceremony at Worlds. Akali’s street aesthetic and hard-hitting lyrics inspired a dedicated fandom. She wields a microphone or kama as a hip-hop ninja, revolutionizing the stale scene with her raw talents. ‘K/DA Akali’ has all new colours, new SFX on her abilities as well as new model, clothing and facial details. The skin stands out with its dragon-themed recall, one representing the visuals from the adored ‘rapping’ part of the ‘POP/STARS” video. The skin is available in the store for 1350 RP and it’s a great buy for the K/DA line connoisseurs. K/DA Akali skin review and information.